Today I want to talk about one of my favorite productivity and motivational tools: time-based task lists. In running a freelance writing business, self-motivation is key. You don't have a boss looking over your shoulder. Other than client deadlines, no one else makes sure you do what needs to be done. It all falls on you. One of the most common productivity tools freelance writers use is the to-do list. I'm a huge fan and have a variety active at any given time (daily, weekly, and project-specific ones at the very least). There's something incredibly motivating -- for some of us at least -- about checking something off a list. It's about the little wins. But to-do lists aren't perfect. They don't always motivate us to get started, especially when we have big projects ahead of us. Something I've suggested before is to break those bigger projects down into smaller, more manageable parts. One option is to create a five-minute list -- a list of projects you can complete in five minutes or less. Because, really, who can't find five minutes? That's a good way to get the ball rolling. Five minutes gives you that first little win. You get to check something off your list. And it can motivate you to keep going. But not everything can be broken down into five-minute increments. And those five-minute task lists can then become a distraction -- encouraging you to focus on quick, easy tasks while bigger projects get pushed back. Because of this, I've started doing something a bit different. In a recent post, I talked about how I use Todoist. One feature I like is "labels," where I can group tasks together in any way I please, even if they're entered under completely different projects. For example, I could add the "five minute task" label to short tasks in any project, then pull up a list of those tasks based on that label whenever I wanted to knock something out quickly. 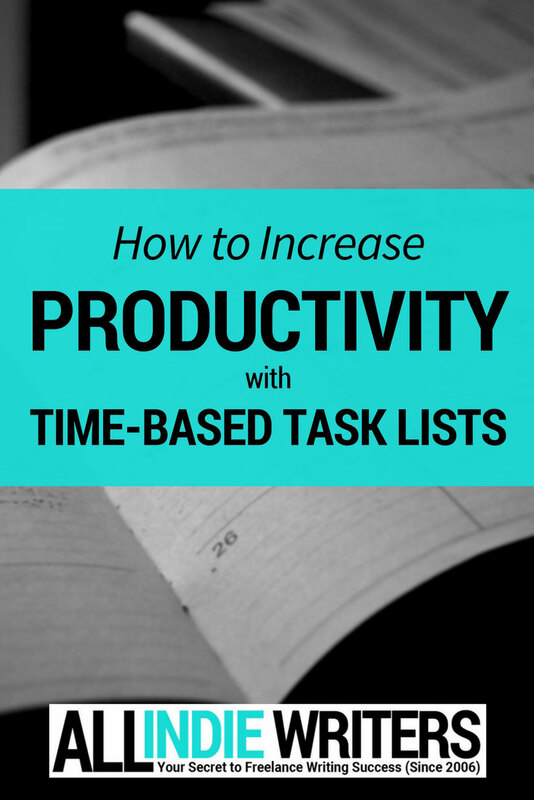 Break everything down into time-based task lists. Again, I use Todoist's label feature for this. But you can simply write up a list if you prefer. Not everything will fit within one of these groups, but most things on my to-do lists do. Why create time-based task lists? They allow you to break down larger tasks, even if those can't be broken into micro-tasks. But, more importantly, it saves you from the procrastination that can stem from "what should I do next?" moments. If you know you have a few minutes to kill, you can pull up your five-minute task list and knock out the first item there instead of spending those five minutes deciding what to do. If you have 30 minutes before your planned lunch break or before a scheduled client call, you pull up your 30-minute task list and get started on something. For me, the one-day task list has had the biggest effect (though I only started using it this month). It comes in handy for big projects like blog development or site audits (my own, or ones I conduct for freelance clients). Where I might otherwise keep pushing something off because the task never fits in a day with other things going on, I know I can dedicate one day to that task and be done with it. Those one-day task lists have really changed how I think about certain projects -- ones that used to feel a bit overwhelming at times. I have to manage more than just the freelance side of my business, so time-based task lists are proving to be incredibly helpful in managing it all. But even if freelancing is your sole business model, there are plenty of tasks you can break down into these time-constrained lists. Write up your work plan or schedule for the following day. Quick social media checks to see if you've heard from prospects who need a response. Read an article about something you want to learn and apply to your business. Schedule some tweets or other social media updates for the day. Brainstorm post ideas for your client-focused blog. Outline a blog post or two. Respond to client emails and / or quote requests. Write a short blog post. Short client calls or consultations. Email -- if you know from a quick check that you have several needing detailed responses. Short client projects -- proofreading, minor copyedits for a page or two, edits after receiving client feedback, etc. Start reading a book about your specialty area (or writing or business in general) to learn something that might help you professionally. If, like me, your work involves more than taking on freelance writing gigs, you can use this same tactic to break everything down -- from taking a day trip to conduct research for your next book to scheduling blocks of time for brainstorming blog post topics. In the end, time-based task lists become part of my larger strategy of task batching. When I know how long everything should take, I can shuffle things around and more easily group similar tasks together. And it's the combination that allows me to get more done, no matter how many distractions I face (and, these days, there are plenty of those to go around). How about you? Do you ever create time-base task lists? Do you do this for all (or most) tasks or just shorter ones, such as using a five-minute list? How has it helped you? Tell me about how you manage your to-do lists in the comments. The 1 Day task sounds interesting to me as you are getting the whole day to do something. This is very helpful Jenn! With too much work, I most likely end up doing nothing with my scattered thoughts. This a great tip to organize everything.